Peter Thomas Senese, a best-selling author, renowned child advocate, and hero to many children targeted for abduction has once again raised his voice as a call-to-arms against the menacing and at times deadly storms of international parental child abduction that will target tens of thousands of families over the coming summer school vacation period. According to reports published by the highly respected I CARE Foundation, a self-funded non-profit organization, Peter Thomas Senese is the founding director of that recently hosted a conference on abduction at the United Nations at the request of the Department of State and its International Visitor Leadership Program, it is estimated that over 80% of all outbound cases of international child abduction will occur during the summer, when children are off from school. Of great concern is that published reports estimate that only 10% of all abducted children will ever be reunited. Some of them will never be able to, as affirmed in a Department of Justice report issued last week citing that children who are abducted by a parent face extreme risk of physical violence, including murder. So any preconceived notion that a child simply can’t be abducted by a parent is out the window. Truth is parental child abduction is a crime. It’s called kidnapping. And the abduction of a child is done the vast majority of the time by a sociopath who has intent to cause the targeted other parent pain and suffering by using a child for revenge. They do not care about the child. They care about themselves. So stopping these abductions is critical. And that is exactly what Peter Thomas Senese and the I CARE Foundation, along with a group of other child advocates have been trying to do. The I CARE Foundation, under Peter Senese’s direction, has played an important role in the dramatic decline in the number of international parental child abductions originating from the United States by 15% over each of the last two years (2011 and 2012). 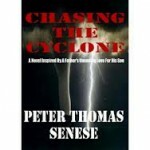 The I CARE Foundation can trace its roots to Peter’s widely critically acclaimed novel ‘Chasing The Cyclone’; a fast-paced legal thriller about a father heroically searching for his internationally parentally kidnapped child who has disappeared into a sea of billions of faces at the hands of malice by the child’s other parent. 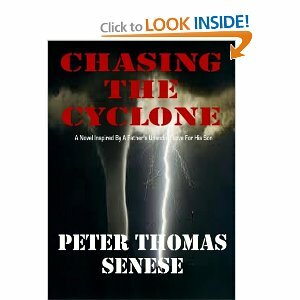 In fact, it has been said that Peter Thomas Senese’s ‘Chasing The Cyclone’ is a book of miracles; a view supported by many testimonial letters from parents around the world. With the school summer vacation here many parents, particularly those involved in multinational or multicultural relationships that have ended must be aware that during the summer school vacation period, international parental child abductions occur around the world. It is vital that parents who may be at risk of abduction know the warning signs of international parental child abduction. If you think it is easy to have a child who is either criminally abducted to another country or who is wrongfully detained in that country returned, you better think again. 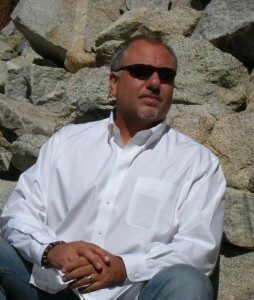 I decided to ask Peter Thomas Senese a few questions. Are children really in danger when they’re taken by one of their parents? Yes. International parental child abduction is a criminal act of kidnapping that usually occurs by an unbalanced hate-monger who has demonstrated sociopathic behavior and who is willing to use a child to cause great pain to the other parent. These abductors do not care about the child, but use the child as a crutch to rationalize their own life and its failures. Make no mistake about it, international parental child abduction is a hate crime. And as cited this past week by the Department of Justice, children are put into grave risk of violence, and even murder by the parent kidnapper. So, a kidnapper is a kidnapper; however, I am of the general view that a parent kidnapper has violated a child even more than a stranger abductor because the parent abductor has violated a child’s trust at the highest level and tries to destroy that child’s identity. How are international family vacation schemes used to abduct a child? Very cleverly. An abductor generally will try to trick the targeted parent into thinking that they are going on a family trip abroad to visit that person’s family. Once there, they unleash an incredibly sophisticated and conspired plan that is the targeted parent’s biggest nightmare. Often, this includes the target having to defend against false charges of abuse, violence, and even murder threats! I urge parents to read a detailed essay I prepared on behalf of the I CARE Foundation titled Summer Vacation and International Parental Child Abduction as well as Dual Citizenship. Two Passports. Child Abduction. What percentage of abducted children are taken during the summer? It is estimated that nearly 85% of all international abductions take place during the summer. I have read many sworn testimonial letters written by parents you have helped, including reuniting many children from around the world. Why do you help other families? My experiences and my professional skills have allowed me to share helpful insight with others, and it is a gratifying experience to know that out of my own families horrible ordeal came a lot of good. So helping others is nothing new to me. I’m just trying to help children and parents because no person should ever experience abduction. .
You have voluntarily helped rescue and reunite a considerable number of children through the courts. Are there any reunification that stands out? They’re all memorable. Each reunification is close to my heart. I wish there were more . . . we fail a lot more than we succeed. But the I CARE Foundation continues to try to help. It is not easy. Fighting abduction is not easy. When a child is victim of parental abduction, who pays for the child’s return? The left behind parent despite this being a federal crime under the International Child Abduction Prevention Act. Unfortunately, most abductors know that the cost to litigate is extremely high. Without money, reunification is near impossible. And unfortunately, the majority of abductors are not prosecuted. Which means that abductors think they have immunity. It plays right into an abductor’s sociopathic wheelhouse. How easy is it to remove a child from a country’s border? Very easy. In fact, just last week a father abducted a little boy from Colorado to Canada despite an Amber Alert being issued. He was able to travel right across the border! There are limited exit controls in place to protect a child. One policy that does exist is the Prevent Departure Program. However, there are grave concerns associated with a child who has a right to citizenship to another country and dual passports. And policy under the Western Hemisphere Travel Initiative allows minors traveling by land or sea to the Canada, Mexico, the United States, and many Caribbean island nations to only present a photocopy of a birth certificate. If a parent has custody, why can’t they just go into the country where the child is being wrongfully detained and bring that child home? Because once they attempt to, they could be charged with abduction in that country and arrested. What can each of us do to stop international child abduction? We can raise awareness of abduction by sharing the warning signs with others. In fact, Parent blog writers have become heroes to at-risk children and their families because they raised awareness. And of course, each of us can support new legislation created to stop abduction. What should a parent do if they believe their child is at risk of abduction? The first thing is to immediately contact a qualified family law attorney. If international abduction is in progress, parents must contact law enforcement immediately, and then they should contact the Department of State’s Office of Children’s Issues. They should also open up a case with the National Center for Missing and Exploited Children. And they should read as much information about abduction as possible by visiting websites that extensively cover abduction such as the I CARE Foundation. You are one of the most published writers covering international parental child abduction and have dedicated years of your life stewarding the message of abduction prevention and risks to a child. Have you seen any results? I think the drop in the reported cases of outbound abduction by 15% during 2011 and 2012 speak for itself especially when the previous growth rate was nearly 20% per year, but there is another part of this story. The unreported cases of abduction associated with undocumented residents is believed to be at least 100% of the abduction cases, and though not measureable, I know the number of undocumented residents the I CARE Foundation helped has increased dramatically. I also know the number of abduction prevention cases has increased dramatically and that’s because parents are becoming aware of abduction. You’re a best-selling author who has written a diverse collection of geopolitical thrillers, yet you have spent several years of your life dedicated to helping families in crisis. What can fans of your writing expect in the near future? Well, I must say, I have been writing, but not novels! It has been a privilege to work with my research partner Carolyn Vlk and published extensively on the subject. So, I did utilize my writing skills . . . just in a very different way! This said, I am looking forward to finally publishing the hardcover of Chasing The Cyclone, which is presently available in e-book everywhere. And I am truly looking forward working on the nearly completed novels titled ‘Predators Games’, which is the sequel of ‘The Den of the Assassin’, and the sequel of ‘Cloning Christ’, titled ‘Quest’ . . . but right now, there is a war against international parental child abduction going on. Targeted parents may not realize they are about to become victims of abduction – so it’s our job to scream the alarm by letting them know the warning signs of abduction. For more information on Peter Thomas Senese, please visit his official website. For more information about the I CARE Foundation, please visit their official website. And if you would like to get involved and lend your voice to help stop international child abduction, please contact the I CARE Foundation at mediarelations@stopchildabduction.org. 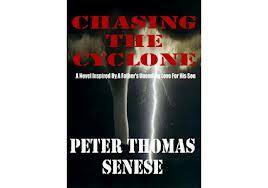 I was sent a copy of the book Chasing the cyclone by Peter Thomas Senese. The author emailed me and told me a little about the book and how it is a true story about how his son was taken out of the country by his ex wife and was told he was not returning. The book is a rivoting story about what he went through to get his son back and how the courts in other countries always rule in favor for the parent who now resides in their country. This book will outrage you and scare you with how much this actually occurs. The son of author Peter Thomas Senese named Alex was abducted by his mother to Canada after their brief marriage ended. The father stops at nothing to get his son back taking him to Canada and New Zealand. You will learn so much information on parent child abductions and how easily it can happen and how the parent almost never get their child back. He is now helping other parents with the I CARE Foundation get their children returned. He has offered me some insights on the subject. “During the summer vacation months, many parents intending to internationally abduct a child will use the summer school break to carry out their plan. In many cases the parent intending to internationally abduct a child will tell the targeted parent that they want to take the child for a summer visit abroad in order to see their family members living in another country. They disguise their intent to abduct as a family vacation (with or without the other parent). Once the child is in a foreign country (typically the scheming parent’s country of origin), they will make claims of abuse and neglect by the other parent (these claims are equally made amongst men and women abductors in order to defend against the conspired act of abduction). Once this is done, they notify the other parent that they and the child are not returning to the country where the child was living. All too often the targeted parent faces incredible circumstances . . . and returns home without their child while they seek legal remedy. The recovery rate of abduction is very, very low. There are no fool-proof warning signs that your spouse or ex-spouse is thinking of taking your child across international borders, with or without your permission and knowledge. However, there are in fact many signs and signals that can provide you with insight that your spouse or former spouse is intending to abduct with your child. Most of all, trust your instincts. If you have reason to believe that your spouse is in the process or is contemplating the abduction of your child, you must not wait: contact your local police and a lawyer familiar with family law and custody matters. You may need to file an ex parte (an Emergency without notice filing) motion to the court of jurisdiction where the child lives, seeking court intervention prior to when the abduction or wrongful retention occurs. Under most laws, the judge will have to hear your application so long as you present enough strong and credible evidence that your spouse or ex spouse is planning to take your child across state or international borders. The most obvious warning sign is if the other parent communicates in any way that they have intent or a desire to remove the child of the relationship out of the country. In most instances, if the other parent threatens you with the idea that they are going to abduct your child, the fact is that in most cases, the abduction is already planned and may be in progress. 1. Be aware of the possibility of any abduction. Although there are no foolproof warning signs for abduction risk, some indicators should not be ignored. Do not stick your head in the sand and pretend that your child is not at risk. 2. The vast majority of international child abductions occur by a parent who is determined to cause hardship and harm to the other parent. The instrument that they use in order to cause this harm is the child or children of the marriage. A significant number of leading therapist from around the world have stated in numerous reports that revenge is the primary and leading reason why one parent will try to end the other parent’s relationship with their own child. Therefore, if you are involved with a person who has jealous or revengeful tendencies, you must be aware that these characteristics are common in the vast majority of would-be parental child abductors. 3. If the issues raised in Section 2 are true in your situation and your spouse or former spouse has in the past used the child of your marriage or relationship to cause you harm, pain, and suffering, or, has tried to control and manipulate your actions, then your concern should be magnified ten-fold. If the same individual has family members in another country or has lived in another country and has expressed a desire or threat to move there with your child, your concern should be magnified one-hundred fold. 4. If there is evidence of previous abductions, disappearances, or threats to abduct the child by your spouse or ex-spouse, these indicators demonstrate that any new abduction threat is real and in more likelihood already planned. 5. If your spouse or ex-spouse has citizenship in another country and strong emotional or cultural ties to their country of origin. 6. Unexplainable removal of cash deposits and diminished assets, or unexplainable increases in credit card or bank debt. 7. Concealment of new credit cards or bank debt. 8. Concealed, hidden, and abrupt communication with individuals or family members living in a foreign country. 9. Concealed, hidden, and abrupt communication with a lawyer. 10. Frequent previous trips with child to a foreign country without other parent. 11. Family and friends living in a foreign country. 12. No strong ties to a child’s home state. 13. Strong foreign support network. 14. No financial reason to stay. 15. Possible use of the child as a pawn in order to gain access to non-joint assets. 16. Engaged in planning activities such as quitting job; selling home; terminating lease; closing bank accounts or liquidating assets; hiding or destroying documents; or securing a passport, a birth certificate, or school medical records. 17. A history of marital instability, lack of cooperation with the other parent, domestic violence, or child abuse. 18. An announcement of an unexpected trip to another country with the child. 19. The taking of easily transportable high-valued items such as jewelry upon departing to another country. 20. Adamant unwillingness to leave the child behind with you while spouse travels to a foreign country. 21. Shipping of personal items to a foreign country. 22. A past tendency of your spouse or ex-spouse to relocate and live abroad. 23. In certain jurisdictions – whereas both parents have a joint-right to custody – it is conceivable that a parent possessing a right of custodial authority over the child (this can be joint or sole custody) can legally remove the child of the marriage/partnership to another country for an undetermined period of time (claiming a holiday or short-term trip) without needing permission or actually informing the other parent if a pre-existing travel agreement is not in place already with the court. Essentially, a parent exercising their right of custody over their child can legally remove the child of the marriage/partnership without permission from the other parent if a court order is not issued previously. Not surprisingly, many international parental child abductions occur when one parent takes the child of the marriage to another country for an alleged short ‘family visit’ – however, in reality that person has no intention of ever returning with the child to the place of habitual residency. What typically happens next in these scenarios is that the abducting parent, unknown to the left behind parent, files for a divorce in the country they have abducted to. The divorce motion and affidavit filed makes claim to all sorts of cruel and dangerous behavior against the spouse (thus the reason why they are able to file under an ex parte [without notice] motion). Once the divorce law suit is filed, the abducting parent usually will go underground with the assistance of family and/or friends who usually assisted in the planning of this act. It is critical to note that deception is a critical element in these typical scenarios: the left behind parent is left to believe that their partner and child are on a short vacation (typically to visit family of the partner) at the time of their departure. A few days or weeks later, reality sets in with either a phone call or a letter saying that the partner and child/children are not returning, and that a divorce action has been filed. So, even if you think you are happily married, it is greatly advised to have a legally binding and court registered travel agreement in place prior to either parent exercising a right of custody is granted permission to leave the country with your child. 24. Trust your instincts: if something feels wrong, it probably is. And remember that most international parental child abductions are carefully planned and typically involve the help of others. 25. BEWARE that the other parent may be trying to prepare an Article 13 Defense while remaining in the country prior to an abduction. This may include the other parent filing false police reports or social service reports against you. REMEMBER that if the international courts have reason to believe that the return of the chlld may put the child in grave danger, they will not order for a return to the country of origin under Article 13. The use of false reporting right prior to an international child abduction is a strong indicator that an abduction is planned. 26. If a parent living as an alien citizen of one country but has limited roots to that country and is intending to travel with the child abroad, the risks of an abduction are great. MORESO, if the parent who is planning to depart, say on a few week vacation, does not have the ability to purchase a return ticket back to the child’s country of origin and/or does not have employment and/or does not have housing, then you can bet that upon departure for the so-called ‘vacation’, that parent is not returning. Remember, Intent and Sustainability issues are critical. If a person can’t sustain themselves in the country that their child was born, and, they have no deep roots, why in the world would they want to stay? 28. If an alien-parent has deep connections to another country, and has deep connections to that country’s senior government officials, there is a clear risk. Recently, I have been advising on a situation where the potential abductor has immediate family members in charge of overseeing a fleet of aircraft owned by a Middle East family (or you could say government). Obviously, access to aircraft and departing under immunity of a foreign government are very concerning. I really can’t recommend this book enough. It is by far the most riveting book I have read. As a mother I can feel his pain reading what he went through with not being able to see his son and not knowing if he ever will again and with the judicial system in other countries. I recommend you share this with your friends because it can happen to anyone, especially those whose husband or wife is from another country.